The year is almost at its end and villagers are joining Santa Yeti’s Goblin helpers in order to build a wonderful Winter Market! In there, you can see a gigantic Christmas tree made of icicles and stalls where you can get all sorts of tasty delicacies! Drink some “Elvenade” and Honey Mead and eat Candy Apples or Gingerbread as you wait for the arrival of Santa Yeti! Also, you can complete event quests or search around your city to collect Snowflakes; you can use them to open Festive Treats containing amazing prizes like event buildings and returning Winter Event buildings! Festive Treats will earn you Delicacies which you can use to unlock the Grand Prizes! Especially for this year if you manage to get all Grand Prizes you will get the Snow Owls Set! 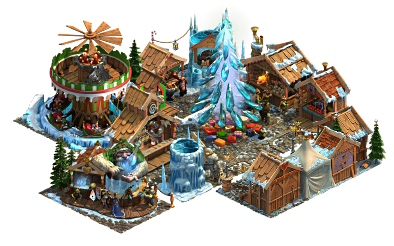 Additionally, you may get the separate buildings from Daily Prizes and construct the Winter Market Set! Furthermore, this year’s special building, the Winter Ferris Wheel will give you Broken Shards, Knowledge Points, Coin Rain, and Supply Windfall! You can use them to produce some valuable rewards! You can find out more in the video below!